Romantic comedies are tricky. The category is home to more mediocre and just plain terrible releases than most other genres. There are of course exceptions, but there is a standard formula most follow that greatly reduces any chance of originality or substance. 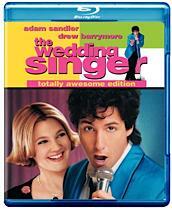 'The Wedding Singer' mostly adheres to this tried and true formula, and though not an example of the best the genre has to offer, it does occasionally rise above its lesser siblings, mostly thanks to its cast and a genuine level of sweetness on display in the film's execution. Just a few years after gaining popularity with his man-child comedy classics 'Billy Madison' and 'Happy Gilmore,' Adam Sandler returned to screens with a comedy that departed slightly from his usual fare. Though romance played a part in those earlier films, 'The Wedding Singer' is much more overtly romantic and placed the comedian in a more sensitive role. Here Sandler plays of course, a wedding singer, who is left at the altar and subsequently falls in love with a waitress (Drew Barrymore) who frequently works the same gigs that he does. Of course, she's already engaged to a massive jerk, and through the course of the film we make our way toward the inevitable conclusion. Though the film follows the usual romantic comedy formula with a one dimensional antagonist, secret feelings, and plot-convenient misunderstandings, Sandler and Barrymore slightly elevate the material with nice chemistry and general likability. It's no surprise that they ended up paired together again years later in '50 First Dates.' Since the film is set in the 1980s, much of the comedy comes from frequent jabs and references to eighties fashion, pop culture, and technology. Though easy jokes, they do provide some laughs, and along with Sandler's trademark spurts of rage, they make up the comedic backbone of the film. The story may be clichéd and formulaic, but there is an earnest sweetness to the script and performances. Some jokes definitely fall flat and haven't aged as well as others, but there are still laughs to be found here. Even if it doesn't quite rise above the usual mediocrity of its genre, it's a solid effort that proved to be quite popular when it was originally released in 1998. Presented with a 1080p VC-1 transfer in the 1.85:1 aspect ratio, the video quality here is unfortunately lacking pretty much all across the board. An overall softness and lack of dimensionality plagues the transfer. There are essentially no moments of real depth, and there is little fine detail apparent. Colors and contrast are mostly just OK, with the occasional pop one would expect from a visual palette as vibrant as this. Shadow delineation is adequate, if not slightly crushed, and black levels are fairly deep. Light grain is present in some scenes, but many appear to exhibit the waxy, smeary quality usually attributed to Digital Noise Reduction. This is a shame, and though not as excessive as other releases, it's unnecessary and hurts the presentation. The film itself doesn't exactly place emphasis on its visuals, and while disappointing, the subpar presentation doesn't detract too much from the movie. However, it still seems like more care and attention could have been used in providing a stronger high definition transfer. As it stands, the visuals don't provide the usual strengths one hopes for with Blu-ray. The audio fares much better than the video, but it still isn't exactly impressive. The film is presented with a Dolby TrueHD English 5.1 track as well as a standard Dolby Digital English 5.1 track with optional English and Spanish subtitles. Dialogue is clean and easy to understand, and though mostly front loaded, surrounds do come into use occasionally. Music plays a large part in the film, and the soundtrack presents the old eighties hits and performances nicely. These music sequences are really where the soundtrack comes to life and exhibit the most surround usage. Balance is mostly good, though dynamic range is a little on the flat side, with the most range, again, being demonstrated in the music sequences. Overall, the soundtrack gets the job done, and certainly does the film better justice than the video quality. Just a quick note, the disc defaulted to its standard Dolby track instead of the TrueHD on my player, so you may want to make sure it is set to your preference before watching the film. New Line has dubbed this release the 'Totally Awesome Edition', and with such a lofty and oh so clever proclamation, one might expect a nice amount of interesting extras. In fact, at the very least, one might expect some basic extras. Unfortunately, the "awesomeness" of this disc has been grossly exaggerated. There are exactly two supplements here, and neither is of any substance. A Backstage Look at The Wedding Singer on Broadway (SD, 10 min) - Presented in standard definition with no subtitle options, this brief look at the making of the Broadway adaptation of the film is pointless and uninteresting. Pure fluff, this actually made me want to avoid the production. Why an actual featurette about the movie wasn't included, I have no idea. Theatrical Trailer - The trailer for the film, presented in standard definition. Though the 'Wedding Singer' isn't exactly a classic, it's a sweet and competent romantic comedy kept aloft by its talented leads. It's really a shame that this release isn't up to par in its technical presentation and supplements. The film deserved better. This 'Totally Awesome Edition' is unfortunately, anything but.